A majority of children who are diagnosed of cancer in India are either malnourished or cannot afford treatment or both. 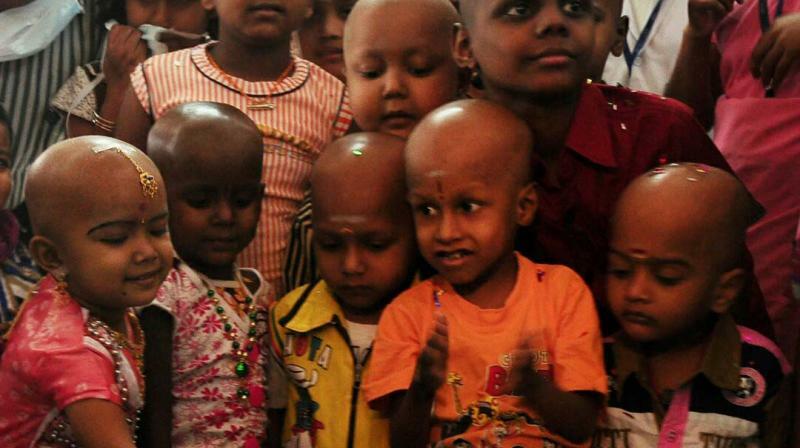 Coimbatore: Cancer that affects children is curable. The disease has a reputation of being one of the major causes of death in adults, one per cent to two per cent of children in India suffer from pediatric cancer and the mortality rate is remarkably low. These reminders came to the fore as September is dedicated to spreading awareness about childhood cancer. Dr P Guhan of the Sri Ramakrishna Institute Of Oncology and Research, who has been treating children diagnosed with cancer since the year 2000, reiterates that the difference between cancer in children and in adults is the fact that pediatric cancer through various treatment modalities can be cured. A majority of children who are diagnosed of cancer in India are either malnourished or cannot afford treatment or both. Leukemia accounts for 30 per cent of cancer in children. Various tests can tell if the child is suffering from cancer. Advance medical tests can confirm if the cancer has spread to other parts of the body from where it originated, says Dr Guhan. Blood cancer survivor Gokul who will celebrate his first birthday as teenager the following week recalls how getting treated for the disease drained the financial resources of his family. “I never got into any bad habits like the boys of my age did, yet I suffered from leukemia. My parents sold everything that they had to pay medical bills. The rest of my family did not know I was diagnosed with cancer due to social pressure. Help came from a few organisations, but there is a limit how much one can help.” he said. Both his parents are working in the hosiery town to repay loans. He has rejoined school in the cotton city after a break of two years and is currently staying with his maternal grandmother. In India the cure rate in childhood cancer is 80 per cent. Dr Guhan says if more number of people come ahead and help victims and families, an increasing number of children can be cured. In a bid to help children suffering from cancer, Sri Ramakrishna Hospital started the 'Sri Ramakrishna Care Trust' in 2005. As many as 800 children diagnosed with cancer are beneficiaries. The trust treats children cancer patients who cannot afford the same free of cost. One of the beneficiaries of the trust, Rahul (name changed) was suffering from blood cancer. He underwent treatment and was successfully cured of the disease. Currently, he is employed in a factory as a supervisor. Kalai (name changed) another beneficiary of the trust has also been cured of cancer. To mothers of a few months' old baby, doctors say that chances of the infant acquiring cancer are slim.